Abstract: Latest results in Education for Sustainable Development (ESD) research and practice show a tendency towards more holistic approaches aiming at deep transformation of the self and the meanings of human existence. Aligned with this, we present the Transdisciplinary Framework of Worldviews and Behaviours (TFWB) to describe the possible formation and expression of a worldview, a complex constellation of meaning and identity from which all human conduct emerges. Four key principles arising from the TFWB are: 1) The whole embodied nervous system is greater than the sum of its separated parts, especially when it comes to intelligence (information processing) and learning (meaning making); 2) The mind is a highly emotion-dependent and mostly unconscious entity; 3) A worldview is a unique arrangement of meaning each person builds, and lives through; and 4) Increasing self-awareness about how a personal worldview is formed and expressed generates increasing opportunities for that individual to explore and build a different meaning for their experience, or to explore and choose different forms to express it (behave). The TFWB informs a new perspective on learning that could be useful for the achievement of ESD’s transformative goals, guiding the innovative design of educational initiatives encouraging new conceptualizations about the meanings of being human; thus, facilitating potential behavioural transformations toward a more sustainable existence. Keywords: Worldview, mind, emotion, cognition, learning, transformation, behaviour. Research and practice focused on improving the relationship between humans and nature has endured significant changes over the history of Environmental Education (EE), and particularly since the Earth Summit in 1992 when Education for Sustainable Development (ESD) was officially recognised. EE and ESD have evolved from an applied science approach with a positivist orientation dominated by efforts to connect conscious knowledge with behavioural changes, to a range of more holistic approaches aiming at the deep transformation of the self by engaging people in existential questions about the meanings of the human experience (Stevenson 2013). In recent years, new global efforts to advance and accelerate this type of transformative education have surfaced. Part of this work includes the discussion of the influence of worldviews on behaviours (Aitken 1988; Devlin 2010; Harraway 2012; Hedlund-de Witt 2014b, 2014a; Hurst 2013; Macy 2007, 2012; Mandala 2010; O’Brien 2013a; O’Brien 2013b; Patel 2008; Schein 2015; Schlitz 2010; Sharma 2007; Van Opstal 2013). A personal worldview is a complex mental constellation of meaning created by someone to describe her/his own reality or ‘sense of self’ (Whitehead 2010), and it seems to enclose the ‘hidden power’ to break through existing limitations regarding motivation-for or resistance-to sustainability (Schein 2015). 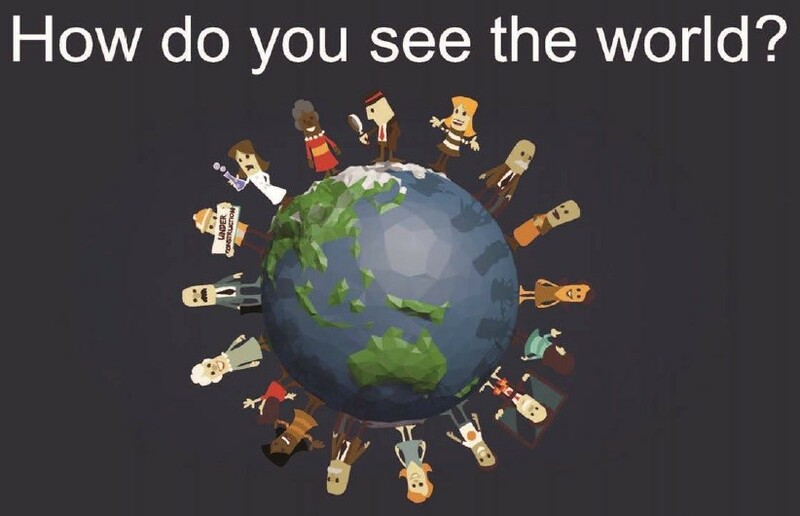 The increasing interest in worldviews relates to the quest to understand how a personal worldview determines someone’s behaviours, far beyond pure conscious knowledge or willingness to act in a specific way (Stevenson 2013). This paper contributes to such discussion by presenting a preliminary theoretical framework called the Transdisciplinary Framework of Worldviews and Behaviours (TFWB), which describes how a personal worldview is formed and how it is expressed through a layered phenomenon that determines the wide range of human conduct. Additionally, this paper argues the potential benefit of the TFWB as a new learning framework to guide ESD initiatives. The use of the TFWB to inform the design and implementation of educational initiatives could implicate the individual and collective exploration and transformation of the meanings of the human experience, translating those meanings into more sustainable behaviours and ways of being. Human behaviour has been studied for centuries in almost all disciplines of knowledge. The vast accumulation of literature explores different aspects like its causes, evolution, expression, measurement, modelling, training and change; and shows a wide diversity of definitions, methods, models, approaches and theories. In many cases there are visible contradictions, lack of agreement and unanswered questions; however, sometimes the consensus is also evident. The Transdisciplinary Framework of Worldviews and Behaviours (TFWB) synthesises well-recognised discussions and postulates, revealing the underlying commonalities, and building an integrated explanation of how our conduct originates and unfolds. The term worldview represents the powerful adhesive that brings together apparently distinct and contrasting premises from divergent academic fields, forming an innovative and transdisciplinary explanation. Represented in Figure 1 as an onion-like diagram, the TFWB connects the neurological dimension of an individual, which gathers data about oneself and the surrounding environment (1), with the mental dimension, where such information is interpreted and interwoven into a worldview – a complex and hierarchical constellation of meaning (2). The TFWB then depicts how such meaning is translated into the wide range of possible behaviours (3, 4, 5). Figure 1. The Transdisciplinary Framework of Worldviews and Behaviours. This diagram displays five nested and interdependent layers, where each layer represents an increase of possibilities in comparison with the adjacent layer on the inside. This means that anyone can display a wide range of behaviours even when exposed to the exact same stimulus; so, instead of a linear relationship, the onion represents what Ingham explains as an increasing variety in the extent to which each of us perceive and respond to the same (or different) experiences and opportunities in life (Ingham 1999). The five layers are holistically integrated as they operate back and forth from the core to the outside of the onion, a complex dynamic that is briefly described in the following sections. For centuries it has been argued that the human brain is the fundamental source of our deepest self or identity (Spencer-Oatey 2007). However, the framework presented in this article conceives of the brain and the body as inherently joined elements not able to exist separately (Lancaster 2013). It is this whole neural complex of brain and body that makes it possible to compute all the data gathered from our inner and outer environments, rather than any of its isolated parts like the spinal cord or the brain in the Central Nervous System, or the nerves across the body in the Peripheral Nervous System (Northoff 2006; Siegel 2001). The first (core) layer of the TFWB represents the integrated work done by all the neural components distributed across the entire organism. As soon as the gene expression commences and the foetus starts developing the nervous system, multiple senses (Prieto-Gonzalez 2014) detect stimuli from the inner environment (like somatic sensations, sugar concentrations in the blood, or heartbeat acceleration) and from external sources as well (like the sounds in the womb) activating trillions of neural connections to compute all data gathered (Greenfield 2002; Hawrylycz 2014; Northoff 2006). In the TFWB, the computation of the information gathered by the senses is regarded as intelligence, a neural capacity rooted in the evolution of neurobiological mechanisms (Carello 2012), generally held to be a mostly unconscious process (Schooler 2015; Smallwood 2015; Smith 2015; Squire 2015; Wilson 2002b; Zador 2014). It has been suggested that 95% of human behaviour is controlled unconsciously (Bargh 1999). To represent this fundamental aspect of the human condition, consciousness is shown as a thin slice in the TFWB diagram (Figure 1). A range of hypotheses propose details of how stimuli and neurons interact; for example, it has been argued that a coalition of pyramidal neurons linking the back and front of the brain cortex fires in a unique way, where different coalitions activate to represent different stimuli (Koch 2007). Alternatively, neurons across the brain can also fire in synchrony and prevail until a new stimulus prompts a different assembly to emerge, such that various assemblies interact in endless continuums (Greenfield 2002). The TFWB also embraces the quantum explanation of life, where brain cells are considered to fire through quantum particles interacting in chaotic and unpredictable ways (Beck 1998; Gardiner 2010; Gennaro 2007; Georgiev 2015; Meijer 2014; Sanchez-Canizares 2014; Tarlaci 2010). Regardless of the hypotheses above, each individual’s genotype expresses in a unique way (Abeyta 2004); consequently, each nervous system is slightly different even between genetic clones (identical twins), which means that each person computes stimuli differently, experiencing life in a unique way (Koch 2007). Electricity running across the neuronal cells fires personalized patterns of cellular connections with particular strength and extension in its brain cells (Matzel 2011; Taylor 2015; Varki 2008); hence, intelligence is a common neural process shared among humans but differentiated in each and every individual. The core layer of the TFWB graphic alludes to the whole nervous system spread across the entire body as the organic structure designed to gather and compute data from the internal and external environments in a unique way for each individual. Although there is not yet clarity about how the nervous system forms the mind, the next layer provides a possible theoretical approximation. The TFWB aligns with the perspective of several authors (Cote 2014; Spencer-Oatey 2007) in regarding the mind and its worldview (rather than solely the brain) as the fundamental source of our deepest self or identity; however, limitations of current research methods (Bryant 2007; Hawrylycz 2014; Siegel 2001) mean that how exactly neural connections form the mental worldview is not yet clearly understood. Consequently, the TFWB becomes an interweaving analysis of the literature, combining some of the most recognized premises on meaning making and human behaviour, to provide a transdisciplinary explanation of how our conduct might originate and unfold. The schemas theory (Piaget 1952) explains that each stimulus received by the senses is mirrored into a mental concept or schema (Barrouillet 2015; Dale 2013; Mazzone 2015; Piaget 1952; Webb 2015); however, schemas are not sufficient for comprehending reality, they are just isolated data which ‘do not assert anything, or purport to explain anything, nor can they be tested against evidence or experience’ (Hand 2012, pp. 528-30). In order to distinguish all elements involved in any given experience, the person must impose order and meaning on these mental entities (Hand 2012; Koltko-Rivera 2004). The TFWB identifies embodied cognition as the master process through which schemas, the first product of information processing, are structured into an epistemological hierarchy of meaning named worldview, represented by the second layer of the graphic. The basic premise of embodied cognition is that intelligence (information processing) is not a centralized, abstract, and exclusively cerebral process; instead, it is an evolved capacity largely dependent on a) bodily awareness or sensations (emotions), where schemas represent mostly the sensorimotor experience, and b) memory, the storage and retrieval of schemas previously created (Amin 2015; Anderson 2003; Mahon 2008; McClelland 2015; Pessoa 2008; Squire 2015; Wilson 2002a). Embodied cognition also argues that the basic schemas are mapped and connected to form more abstract pieces of information. Named conceptual metaphors, these abstract forms consist of simple arrangements of schemas based on comparisons among them, identifying a schema in terms of the others, from the same or a different field of knowledge, aiming to imitate the experience in turn (Amin 2015; Anderson 2003; Dreyfus 2015; Nunez 2015; Sherin 2015). The next, and more sophisticated, level of intelligent computation implies that conceptual metaphors are constantly integrated or blended (Amin 2015; Dreyfus 2015; Koch 2007). The blend represents a more complex structure where meaning starts to unfold (Dreyfus 2015); therefore, the blend could be called interpretation because to interpret is to assign meaning or to explain the meaning of something (Oxford Dictionary of English 2010). In the TFWB, intelligence is equivalent to information processing, whereas learning is the capacity to build meaning; therefore, learning is conceived of as an attribute of intelligence (Dietterich 2013; Kolb 1984). 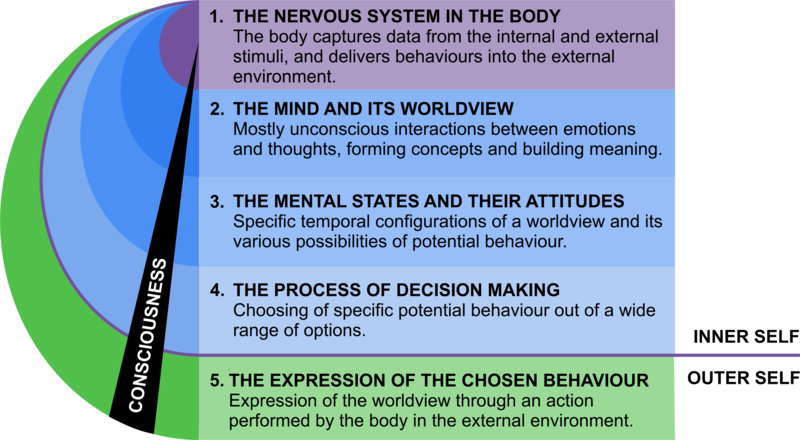 The TFWB links the embodied cognition precepts with studies on perceptions, defined as complex arrangements of meaning, encompassing the identification, interpretation and arrangement of bodily sensations (translated into schemas) in order to form an inner representation of the world (Izard 2010; Schacter 2011). It has been suggested that people form levels of perception in which meaning is constantly filtered by comparing and blending ‘incoming information and the value placed upon it’ (Wubbolding 2009, p. 50). The integration of similar perceptions (from the same field of knowledge) gives rise to a meaning system, a set of related perceptions constituting the lens through which individuals interpret, evaluate, and respond to their experiences and encounters, providing a fundamental sense of purpose which is vital for human existence (Ivtzan 2009; Park 2007; Silberman 2005). In the TFWB the schemas theory, basic embodied cognition precepts, and studies on perceptions are also related to a particular definition of a worldview, which describes it as an integration of five primordial meaning systems: ontological (perceptions about nature, reality, the universe, the divine, God), epistemological (perceptions about what we know and how we know it, how can we gain or build knowledge, what is valid knowledge), axiological (perceptions about value, ethics and morals, what is good and what is bad, what is life all about), anthropological (perceptions about who the human being is, what is our role and position is in the universe, what is the purpose of human existence) and sociological (perceptions about how society should be organized and how societal problems and issues should be addressed) (Hedlund-de Witt 2014b, 2014a). The term worldview derives from the German weltanschauung which means ‘a view of the world’, including how an individual knows, thinks, feels and acts what is in the world and in her/himself (Hand 2012, pp. 528-30; Johnson 2011). It frames the relationships of oneself (endoself or internal/inner world) with the world (exoself or external/outer world) (Johnson 2011; Patel 2008). It shapes how we understand and interact within ourselves and with the world (Vroom 2006). A worldview is the subjective meaning given to reality, speculative and practical, explaining life experiences and prescribing patterns of responses (Hand 2012). The first and second layers of the TFWB represent how the nervous system spread across the body gathers data from internal and external stimuli, and gives rise to the mind, an embodied entity (Siegel 2001) where the worldview is formed. Embodied cognition is the master process where intelligence (information computing) and learning (meaning making) occur in conjunction and permanently, producing increasingly complex meaning structures. The meaningless schemas, interpretations and perceptions are constantly compared and blended, forming a personal worldview. The following three layers briefly explore how such a unique constellation of meaning is gradually expressed, unfolding into a wide range of behaviours. The bodily nervous system and its mental worldview are dynamic entities in cyclical, perennial and uniquely personal interactions, constantly processing information received from stimuli, and procuring the optimal responses to the experience at hand (Adolphs 2003; Carandini 2014; Ingham 2000; Squire 2015, pp. 9-10). There is a simultaneous rivalry and coalition between the evolutionarily primitive, unconscious and automatic processes (largely controlled by emotions), and the intermittent ‘conscious deliberative general-purpose type of reasoning’ (Jack 2013, pp. 25-6), due to several networks of neurons and synapses in different regions of the brain being in permanent tension and competing for attention (Hasenkamp 2012; Jack 2013; Smith 2015). Such dynamism implies a sequence of singular moments, where each instant shows a specific configuration of the nervous system hence the worldview; and such particular arrangement of meaning is what the TFWB recognized in the literature as a mental state. Although there is not a unifying theory to explain how the brain switches a mental state on and off (Salzman 2010), it is recognised that stimuli steer the collaboration or competition of large sets of dynamic variables (neural circuits, memory, attention, emotions, thoughts, consciousness), inextricably linked in an ongoing feedback loop that alters the fluctuation among mental states (Ergas 2013; Hasenkamp 2012; Salzman 2010; Smallwood 2015; Smith 2015), where the resulting configuration could be maintained over relatively long periods of time but could also rapidly change in response to new stimuli (Salzman 2010). Thus, the TFWB recognises an attitude as the disposition created by all variables of a mental state working together, to make the body ready to act in a certain way. A mental state produces a set of potential behaviours or attitudes, like Bradford’s description of the fight-or-flight potential responses (Brown 2002; Kennedy 2014), from which one will be chosen and performed in a spontaneous or in a deliberate form (Fitzgerald 2014; Knappik 2015). Once a particular mental state is installed with its range of attitudes (readiness to act in different possible forms), the mind chooses one of those attitudes and translates it into a specific and concrete action or behaviour. Making such a choice implies the activation of a decision-making process, a highly emotion-dependent (embodied) human feature, according to the latest research in this field (Floresco 2015; Kennedy 2014; Lerner 2015; Santos 2015; Yip 2013). Preferences, judgments and choices have, since Plato, been associated with rational thinking, arguing that logic rules over emotion (Haidt 2003; Lerner 2015; Pessoa 2008); however, in alignment with the embodied cognition precepts, the TFWB recognises that ‘a revolution in the science of emotion has emerged in recent decades, with the potential to create a paradigm shift in decision theories’ (Lerner 2015, p. 799) centred on how emotion actually rules over reasoning, including the fundamental work on moral emotions (Haidt 2003; Moon 2012). The reasoned, reflective, controlled, rational or cold mental mechanisms (studied by cognitive sciences) have been recognised as the ultimate mental authority when it comes to decisions, neglecting the role of the impulsive, reactive, automatic, experiential or hot mental mechanisms (studied by affective sciences) (Alos-Ferrer 2014; Santos 2015). But new research on affective sciences is changing the argument and recognising the dominance that emotions can have over thoughts, by establishing that hot and affective mechanisms are ‘assumed to yield default responses unless intervened on by’ the cognitive ones (Evans 2013, p. 223), ‘at the expense of willpower’ (Alos-Ferrer 2014, p. 3). What is crucial to recognise is that dividing the brain into cognitive and affective regions is inherently problematic because brain regions viewed as affective are also involved in cognition and vice versa (Burum 2007; Pessoa 2008, p. 148). Cognition and emotion are integrated in the body and ‘complex cognitive–emotional behaviour emerges from the rich, dynamic interactions’ among all the neural components (Pessoa 2008, p. 148; Wilson 2002a). The literature shows a wide range of definitions of human behaviour (Abrams 1989; Adolphs 2003; Clayton 2010; Ergas 2010; Ergas 2013; Hurst 2013; Ingham 1999, 2000; Jackson 2015; Manning 2009; Raina 2011; Silberman 2005; Sommer 2011), but in this article it has been argued that our conduct is the most physical representation of our personal worldview (Koltko-Rivera 2004; Park 2007; Schein 2015). In the TFWB, behaviour is the resulting physical action of someone’s body, chosen from a set of different attitudes generated by the dominant mental state, which is a momentary representation of such person’s worldview, dependent on the stimuli perceived by the senses, and whose ultimate intention is the survival and adaptation of that organism to the ever-changing life experiences (Stern 2000). Behaviours are marked in the external layer of the TFWB diagram, representing the context where the individual is located. Analogous to Freud’s iceberg model of human behaviour (Curtis 1991), this layer equals the tip of the iceberg – what is observable. In contrast, the previous four layers belong to the internal world of a person – below the surface and invisible to the human eye. As explained in the introduction to this paper, the five layers are holistically integrated as they operate back and forth from the core to the outside of the onion, which means that the stimuli captured by the nervous systems propitiates a set of possible behaviours; and then, the actual behaviours impact the context, where new stimuli will be produced and perceived. The fifth layer represents the permanent interaction between the person and the context; including predominantly, the influence of other people’s behaviours and worldviews. In other words, an individual’s worldview and behaviours are shaped to a very large extent by the behaviours and worldviews that the individual creates and/or encounters in his/her own personal journey (Koltko-Rivera 2004; Siegel 2001). In this context, the TFWB provides an integrated explanation about how people apprehend and make sense of their own reality, by forming unique structures of meaning leading to a wide range of possible forms of being and behaving. Having this explanation makes it possible to reframe ESD’s fundamental goals, recognizing that the ultimate transformation of unsustainable behaviours is inherently dependent on the previous transformation of unsustainable choices, attitudes, mental states and worldviews, into more sustainable ones. Although the inaccessibility of the mind (even to ourselves) makes this a challenging task for the ESD community, there are four key principles derived from the TFWB that could provide some innovative guidance. Principle #1: The whole embodied nervous system is greater than the sum of its separated parts, especially when it comes to intelligence (information processing) and learning (meaning making). The whole neural complex makes it possible to compute all data gathered from stimuli and build the corresponding meaning in its entirety; rather than in its isolated parts, such as within only the brain. This systemic approach to the nervous system represents the need to stimulate the entire body with all the multiple senses embedded (Malone 2008); for example, learning design could include the five most commonly recognised senses as well as proprioception (movement), equilibrioception (balance), mechanoreception (vibrations), thermoception (temperature), and chronoception (the passage of time) (Friedman 2005), instead of focusing on just the logical thinking facet. Principle #2: The mind is a highly emotion-dependent and mostly unconscious entity. In the TFWB, emotions are considered to be the central energy that activates intelligence and learning because they constitute the sensorial trigger prompting the nervous system to create, compare and blend mental schemas continuously until meaning is built (Siegel 2001, p. 80); and both sensory inputs and conceptual representations are mostly unconscious elements (Bargh 1999; Schooler 2015; Smith 2015). Studies on embodied cognition, as well as emerging research on the unconscious mind, support the conception of emotions as ‘the fundamental aspect of mental life’ (Siegel 2001, p. 90); therefore, an increase in the conscious self-awareness of emotions could ‘create a deep sense of meaning and connection within oneself and with others…an integrative processes…proposed to be at the core of emotional well-being…psychological resilience…fundamental to the evolving mechanisms within the life of an individual, dyad, family or community’s continual movement toward mental health’ (Siegel 2001, p. 90). However, people tend to block out unwanted emotions (and thoughts) through conscious suppression and unconscious repression. Hence, some types of introspection, like increasing awareness of unconscious motives to block emotions and thoughts, or the conscious analysis of personality traits, may help people construct beneficial personal narratives (Wilson 2004, p. 493). In summary, learning how, through ESD, to become more conscious of the emotions determining meaning and choices of behaviour by increasing bodily awareness could improve the conscious recognition and management of emotions, which constitute the groundings of the mental architecture, as the TFWB explains. Principle #3: A worldview is a unique arrangement of meaning each person builds, and lives through. Even genetic clones develop a differentiated nervous system, due to the exclusive ways in which each person experiences life, firing exclusive neural connections that develop a uniquely personal worldview. No one has the same set of schemas; and even if we were able to have them, the metaphors and blends, interpretations and perceptions would still be determined by the differentiated process to compute information (intelligence) and to build meaning (learning) that each individual develops, regardless of pure genetics or the number and similarity of experiences lived (Kolb 2014; Sternberg 2005). This means that a group of individuals can display a wide range of different behaviours even when exposed to the exact same stimulus, due to unique meaning arrangements built individually (Ingham 1999). From an educational perspective, it could be argued that preferencing standardizations (e.g., ideology, discipline of knowledge, curricular content, tests and activities) may obscure and disenfranchise the experience of the uniqueness of the self, hindering the consequent acceptance and embracement of human diversity (Kolb 1984; Mandala 2010; Moon 2012). Principle #4: Increasing self-awareness about how a personal worldview is formed and expressed generates increasing opportunities for that individual to explore and build a different meaning for the experience, or to explore and choose different forms to express it (behave). Studying how a personal worldview is formed is equivalent to reflecting on how people process information and build unique arrangements of meaning; which in turn could open the possibilities to explore new meanings for that experience. 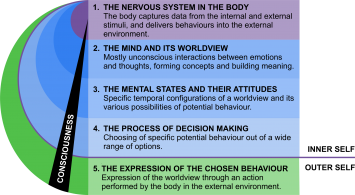 Studying how a worldview is expressed is equivalent to reflecting on mental states, attitudes, choices and behaviours. This could open possibilities to explore mind-wandering and mindfulness, for example, where the practice of how to be fully aware of the dominant emotions and thoughts provoked by a given experience could facilitate a switch between mental states, leading to the exploration of new attitudes resulting in different behaviour choices (Hasenkamp 2012; Kolb 2009; Smallwood 2008; Smallwood 2015). Studying how the nervous system forms the mind, how the mind builds meaning, and how meaning is expressed, could provide increasing opportunities to build and express different forms of significance. In terms of ESD intentions, this type of study could increase and enrich opportunities to deeply transform the self and the meanings of the human existence, allowing space for new ways of learning; and also, new ways of being, becoming and behaving. The ultimate intention of human behaviour is described as the survival and adaptation of each organism to the ever-changing life experiences. At this moment in human history, maybe the survival and adaptation of the species is more dependent on our ability to restore the peace of all minds and to develop deep and long lasting empathy, than anything else (Krznaric 2014 ); which could be translated into the exploration and construction of possible new meanings for the human existence. In this context, the TFWB provides ESD with four key principles highlighting the inherent and exclusively human feature that is to build, change and transform the meaning of any experience at any time; consequently determining the patterns of emotion, thought and action deriving from such meaning. The Transdisciplinary Framework for Worldviews and Behaviour’s main contribution to the ESD community is this: studying how the body gives rise to the mind, how the mind forms a unique constellation of meanings named worldview, and how our own personal worldview is continuously determining how each of us feel, think and act, might provide new insights that encourage all kinds of people to commence the personal journey of self-observation and discovery, as well as significant support to those who have already embarked. The TFWB informs a new perspective on learning that could be potentially useful for the achievement of ESD’s holistic and transformative goals, guiding the innovative design of educational initiatives encouraging the individual and collective reflection on what it means to be a human, and how to change such meaning; thus, facilitating the potential exploration of more sustainable ways of being, becoming and behaving regarding ourselves, others and the environment. Abeyta, M.J., et al. 2004, ‘Unique gene expression signatures of independently-derived human embryonic stem cell lines’, Human Molecular Genetics, vol. 13, no. 6, pp. 601-8. Abrams, D., Brown, R. 1989, ‘Self-Consdousness and Social Identity: Self-Regulation as a Group Member’, Social Psychology Quarterly, vol. 52, no. 4, pp. 311-8. Adolphs, R. 2003, ‘Cognitive Neuroscience of Human Social Behaviour’, Nature Reviews: Neuroscience, vol. 4, pp. 165-78. Aitken, S.C. 1988, ‘Transactional and Transformational Theories in Behavioral Geography’, Professional Geographer, vol. 40, no. 1, pp. 54-64. Alos-Ferrer, C.a.S., F. 2014, ‘From dual processes to multiple selves: Implications for economic behavior’, Journal of Economic Psychology, vol. 41, no. 2014, pp. 1-11. Amin, T., et al. 2015, ‘Conceptual Metaphor and Embodied Cognition in Science Learning: Introduction to special issue’, International Journal of Science Education, vol. 37, no. 5-6, pp. 745-58. Anderson, M.L. 2003, ‘Embodied Cognition: A field guide’, Artificial Intelligence, vol. 149, no. 2003, pp. 91-130. Bargh, J.A.a.C., T. L. 1999, ‘The Unbearable Automaticity of Being’, American Psychologist, vol. 54, no. 7, pp. 462-79. Barrouillet, P. 2015, ‘Theories of cognitive development: From Piaget to today’, Developmental Review, pp. 1-12. Beck, F., and Eccles, J. C. 1998, ‘Quantum processes in the brain: a scientific basis of consciousness’, Cognitive Studies, vol. 5, no. 2, pp. 95-109. Brown, T.M., and Fee, E. 2002, ‘Walter Bradford Cannon: Pioneer Physiologist of Human Emotions.’, American Journal of Public Health, vol. 92, no. 10, pp. 1594-5. Bryant, A.a.C., K. 2007, The SAGE Handbook of Grounded Theory, SAGE Publications Ltd, London, UK. Burum, B.A., et al. 2007, ‘The Centrality of Emotion to Psychological Change’, Clinical Psychology Science and Practice, vol. 14, pp. 407-13. Carandini, M. 2014, ‘From circuits to behavior: a bridge too far?’, Future of the Brain: Essays by the World’s Leading Neuroscientists, Princeton University Press, Princeton, pp. 177-85. Carello, C., et al. 2012, ‘Unnerving Intelligence’, Ecological Psychology, vol. 24, pp. 241-64. Clayton, P. 2010, ‘Something new under the Sun: forty years of philosophy of religion, with a special look at process philosophy’, International Journal of Philosophy and Religion, vol. 68, no. 2010, pp. 139-52. Cote, J.E.a.L., Ch. G. 2014, Identity, Formation, Agency, and Culture: A Social Psychological Synthesis, Psychology Press, USA. Curtis, R. 1991, The relational self: theoretical convergences in psychoanalysis and social psychology, The Guilford Press, NY, USA. Dale, E. 2013, ‘Neo-piagetian Transpersoanl Psychology: A New Perspective’, The Journal of Transpersonal Psychology, vol. 45, no. 2. Devlin, J. 2010, ‘Conflicting Ideologies in Environmental Problem Solving: Conceptualization and Measurement of Worldviews’, University of New Brunswick, 395 Wellington Street, OttawaONK1A0N4, Canada. Dietterich, T.a.M., R. S. 2013, ‘A comparative review of selected methods for learning from examples.’, in R.S. Michalski, Carbonell, J. G., and Mitchell, T. M. (ed. ), Machine learning: An artificial intelligence approach, Tioga Publishing Co., Palo Alto, USA., pp. 41-81. Dreyfus, B.W., et al. 2015, ‘Applying Conceptual Blending to Model Coordinated Use of Multiple Ontological Metaphors’, International Journal of Science Education, vol. 37, no. 5-6, pp. 812-38. Ergas, C. 2010, ‘A Model of Sustainable Living: Collective Identity in an Urban Ecovillage’, Organization & Environment, vol. 23, no. 1, pp. 32-54. Ergas, O. 2013, ‘Mindfulness in education at the intersection of science, religion, and healing’, Critical Studies in Education, vol. 55, no. 1, pp. 58-72. Evans, J.a.S., K. 2013, ‘Dual Process Theories of Higher Cognition: Advancing the Debate’, Perspectives on Psychological Science, vol. 8, no. 3, pp. 223-41. Fitzgerald, C. 2014, ‘A neglected aspect of conscience: awareness of implicit attitudes’, Journal of Bioethics, vol. 28, no. 1, pp. 24-32. Floresco, S.B. 2015, ‘TheNucleus Accumbens: An Interface Between Cognition, Emotion, and Action’, Annuual Review Psychology, vol. 66, no. 2015, pp. 25-52. Friedman, W.J. 2005, ‘Developmental and cognitive perspectives on humans’ sense of the times of past and future events’, Learning and Motivation, vol. 36, no. 2005, pp. 145-58. Gardiner, J., et al. 2010, ‘The Fractal Nature of the Brain: EEG Data Suggests That the Brain Functions as a “Quantum Computer” in 5‐8 Dimensions’, NeuroQuantology, vol. 8, no. 2, pp. 137-41. Gennaro, R.J. 2007, ‘Consciousness and Concepts’, Journal of Consciousness Studies, vol. 14, no. 9-10, pp. 1-19. Georgiev, D. 2015, ‘No-go Theorem for Stapp’s Quantum Zeno Model of Mind-Brain Interaction’, NeuroQuantology, vol. 13, no. 2, pp. 179-89. Greenfield, S. 2002, ‘Mind, brain and consciousness’, British Journal of Psychiatry, vol. 181, no. 91-93. Haidt, J. 2003, ‘The moral emotions’, in K.R.S. R. J. Davidson, & H. H. Goldsmith (Eds.) (ed. ), Handbook of affective sciences, Oxford University Press., Oxford, UK, pp. 852-70. Hand, M. 2012, ‘What’s in a worldview? On Trevor Cooling’s Doing God in education’, Oxford Review of Education, vol. 38, no. 5, pp. 527-37. Harraway, J., et al. 2012, ‘Exploring the Use of the Revised New Ecological Paradigm Scale (NEP) to Monitor the Development of Students’ EcologicalWorldviews’, The Journal of Environmental Education, vol. 43, no. 3, pp. 177-91. Hasenkamp, W., et al. 2012, ‘Mind wandering and attention during focused meditation: A fine-grained temporal analysis of fluctuating cognitive states’, NeuroImage, vol. 59, no. 2012, pp. 750-60. Hawrylycz, M., et al. 2014, ‘Building Atlases of the Brain’, Future of the Brain: Essays by the World’s Leading Neuroscientists, Princeton University Press, Princeton, pp. 3-16. Hedlund-de Witt, A. 2014a, ‘Rethinking Sustainable Development: Considering How Different Worldviews Envision “Development” and “Quality of Life”’, Sustainability, vol. 2014, no. 6, pp. 8310-28. Hedlund-de Witt, A., et al. 2014b, ‘Exploring inner and outer worlds: A quantitative study of worldviews, environmental attitudes, and sustainable lifestyles’, Journal of Environmental Psychology, vol. 37, no. 2014, pp. 40-54. Hurst, M., et al. 2013, ‘The relationship between materialistic values and environmental attitudes and behaviors: A meta-analysis’, Journal of Environmental Psychology, vol. 36, pp. 257-69. Ingham, B. 1999, ‘Human Behaviour in Development Economics’, European Journal of History of Economic Thought, vol. 6, no. 4, pp. 606-23. Ingham, B. 2000, ‘Human Behaviour and Long-run Change’, African Philosophy, vol. 13, no. 1, pp. 33-48. Ivtzan, I., et al. 2009, ‘Linking Religion and Spirituality with Psychological Well-being: Examining Self-actualisation, Meaning in Life, and Personal Growth Initiative’, Journal of Religion and Health, vol. 48, no. 1. Izard, C.E. 2010, ‘The Many Meanings/Aspects of Emotion: Definitions, Functions, Activation, and Regation’, Emotion Review, vol. 2, no. 4, pp. 363-70. Jack, A. 2013, ‘A scientific case for conceptual dualism: The problem of consciousness and the opposing domains hypothesis’, in J. Knobe (ed. ), Oxford Studies in Experimental Philosophy, vol. 1, Oxford University Press, UK. Jackson, F.B.a.G., D. 2015, ‘The ‘strange death’ of radical behaviourism’, Psychologist, vol. 28, no. 1 Radical Behaviourism, pp. 24-7. Johnson, K.A., et al. 2011, ‘Integrating the Study of Culture and Religion: Toward a Psychology of Worldview’, Social and Personality Psychology Compass, vol. 5, no. 3, pp. 137-52. Kennedy, A., et al. 2014, ‘Internal States and Behavioral Decision-Making: Toward an Integration of Emotion and Cognition’, Symposia on Quantitative Biology, vol. Volume LXXIX, pp. 199-210. Knappik, F. 2015, ‘Self-knowledge about attitudes: rationalism meets interpretation’, Philosophical Explorations: An International Journal for the Philosophy of Mind and Action, vol. 18, no. 2, pp. 183-98. Koch, C., and Greenfield, S. 2007, ‘How Does Consciousness Happen?’, Scientific American, vol. 297, no. 4, pp. 76-83. Kolb, D. 1984, ‘The process of experiential learning.’, in C.W.R. University (ed. ), Experiential Learning. Experience as the source of learning and development., Prentice-Hall, Inc., New Jersey 0732, USA., pp. 20-38. Kolb, D. 2014, Learning styles webinar with David Kolb, Hay Group, http://www.haygroup.com/leadershipandtalentondemand/video/details.aspx?id=3962, viewed July, 2014 2014. Kolb, D.a.Y., B. 2009, ‘Mindfulness and Experiential Learning’. Koltko-Rivera, M.C. 2004, ‘The Psychology of Worldviews’, Review of General Psychology, vol. 8, no. 1, pp. 3-58. Krznaric, R. 2014 Empathy: A handbook for revolution, Random House. Lancaster, M.A., et al. 2013, ‘Cerebral organoids model human brain development and microcephaly’, Nature Reviews | Neuroscience, vol. 501, no. 12517, pp. 373-80. Lerner, J.S., et al. 2015, ‘Emotion and Decision Making’, Annual Review on Psychology, vol. 66, no. 2015, pp. 799-823. Macy, J. 2007, World as Lover, World as Self : Courage for Global Justice and Ecological Renewal, Parallax Press, Berkley, Ca. USA. Macy, J., and Johnstone, Ch. 2012, Active Hope. How to face the mess we’re in without going crazy., New World Library. Mahon, B.Z.a.C., A. 2008, ‘A critical look at the embodied cognition hypothesis and a new proposal for grounding conceptual content’, Journal of Physiology, vol. 102, no. 2008, pp. 59-70. Malone, K. 2008, Every experience matters, UNESCO Growing Up In Cities. Mandala, S.M., et al. 2010, ‘Worldview Transformation and the Development of Social Consciousness’, Journal of Consciousness Studies, vol. 17, no. 7-8, pp. 18-36. Manning, C. 2009, The Psychology of Sustainable Behavior, Minnesota Pollution Control Agency, p. 32. Matzel, L.D., et al. 2011, ‘Individual Differences in Animal Intelligence: Learning, Reasoning, Selective Attention and Inter-Species Conservation of a Cognitive Trait’, International Journal of Comparative Psychology, vol. 2011, no. 24, pp. 36-59. Mazzone, M. 2015, ‘Constructing the context through goals and schemata: top-down processes in comprehension and beyond’, Frontiers in Psychology, vol. 6, no. 651, pp. 1-13. McClelland, E., et al. 2015, ‘Enhanced academic performance using a novel classroom physical activity intervention to increase awareness, attention and self-control: Putting embodied cognition into practice’, Improving Schools, vol. 18, no. 1, pp. 83-100. Meijer, D.K.F. 2014, ‘The Extended Brain: Cyclic Information Flow in a Quantum Physical Realm’, NeuroQuantology, vol. 12, no. 2, pp. 180-200. Moon, D. 2012, ‘Multicultural Teams: Where Culture, Leadership, Decision Making, and Communication Connect’, William Carey International Development Journal, vol. Vol 1, no. 3, pp. 1-9. Northoff, G., et al. 2006, ‘Self-referential processing in our brain—A meta-analysis of imaging studies on the self’, NeuroImage, vol. 31, no. 2006, pp. 440-57. Nunez, R. 2015, ‘Some Challenges in the Empirical Investigation of Conceptual Mappings and Embodied Cognition in Science Education: Commentary on Dreyfus, Gupta and Redish; and Close and Scherr’, International Journal of Science Education, vol. 37, no. 5-6, pp. 867-75. O’Brien, K.a.S., L. 2013a, ‘Responding to Climate Change: The Three Spheres of Transformation’, Transformation in a Changing Climate Proceedings, University of Oslo, Oslo, Norway. , pp. 16-23. O’Brien, K.e.a. 2013b, ‘You say you want a revolution? Transforming education and capacity building in response to global change.’, Journal of Environmental Science and Policy, vol. 28, pp. 48-59. 2010, 3rd edn, Oxford University Press. Park, C.L. 2007, ‘Religiousness/Spirituality and Health: A Meaning Systems Perspective’, Journal of Behavioural Medicine, vol. 30, pp. 319-28. Patel, R. 2008, ‘Environmental Beliefs, Values, and Worldviews: Etiology, Maintenance, and Transformation’, James Madison University, Virginia, USA. Pessoa, L. 2008, ‘On the relationship between emotion and cognition’, Nature Reviews | Neuroscience, vol. 9, pp. 148-58. Piaget, J. 1952, The origins of intelligence in children, International University Press, Inc., NY, USA. Prieto-Gonzalez, L., et al. 2014, ‘Applications of ontologies in knowledge representation of human perception’, International Journal of Metadata, Semantics and Ontologies, vol. 9, no. 1, pp. 75-80. Raina, V. 2011, ‘Between Behaviourism and Constructivism’, Cultural Studies, vol. 25, no. 1, pp. 9-24. Salzman, C.D., and Fusi, S. 2010, ‘Emotion, Cognition, and Mental State Representation in Amygdala and Prefrontal Cortex’, Annuual Review of Neuroscience, vol. 33, pp. 173-202. Sanchez-Canizares, J. 2014, ‘The Mind-Brain Problem and the Measurement Paradox of Quantum Mechanics: Should We Disentangle Them?’, NeuroQuantology, vol. 12, no. 1, pp. 76-95. Santos, L.R.a.R., A. G. 2015, ‘The Evolutionary Roots of Human Decision Making’, Annual Review of Psychology, vol. 66, no. 321-347. Schacter, D., et al. 2011, Psychology, Worth Publisher, NY, USA. Schein, S. 2015, A new psychology for sustainability leadership: the hidden power of ecological worldviews., Grrenleaf Publishing. Schlitz, M.M., et al. 2010, ‘Worldview transformation and the development of social consciousness’, Journal of Consciousness Studies, vol. 17, no. 7-8, pp. 18-36. Schooler, J.W., et al. 2015, ‘Minding the mind: the value of distinguishing among unconscious, conscious and metaconscious processes’, in A.P. Association (ed. ), Handbook of Personality and Social Psychology, pp. 179-202. Sharma, M. 2007, ‘Personal to Planetary Transformation’, KOSMOS Journal for Global Transformation, vol. Fall/Winter, pp. 31-5. Sherin, B. 2015, ‘On Conceptual Metaphor and the Flora and Fauna of Mind: Commentary on Brookes and Etkina; and Jeppsson, Haglund, and Amin’, International Journal of Science Education, vol. 37, no. 5-6, pp. 806-11. Siegel, D. 2001, ‘Toward an Interpersonal Neurobiology of the Developing Mind: Attachment relationships, mindsight, and neural integration’, Infant Mental Health Journal, vol. 22, no. 1-2, pp. 67-94. Silberman, I. 2005, ‘Religion as a Meaning System: Implications for the New Millennium’, Journal of Social Issues, vol. 61, no. 4, pp. 641-63. Smallwood, J., et al. 2008, ‘When attention matters: The curious incident of the wandering mind’, Memory and Cognition, vol. 36, no. 6, pp. 1144-50. Smallwood, J.a.S., J. W. 2015, ‘The Science of Mind Wandering: Empirically Navigating the Stream of Consciousness’, Annual Review of Psychology, vol. 66, no. 2015, pp. 487-518. Smith, R.a.L., R. D. 2015, ‘The neural basis of one’s own conscious and unconscious emotional states’, Neuroscience and Biobehavioral Reviews, vol. 57, no. 2015, pp. 1-29. Sommer, L., et al. 2011, ‘The Theory of Planned Behaviour and the Impact of Past Behaviour’, The International Business and Economics Research Journal, vol. 10, no. 1, pp. 91-110. Spencer-Oatey, H. 2007, ‘Theories of identity and the analysis of face’, Journal of Pragmatics, vol. 39, no. 2007, pp. 639-56. Squire, L.R.a.D., A. J. O. 2015, ‘Conscious and Unconscious Memory Systems’, Perspectives in Biology, vol. 7, no. a021667. Stern, P.C. 2000, ‘Toward a Coherent Theory of Environmentally Significant Behavior’, Journal of Social Issues, vol. 56, no. 3, pp. 407-24. Sternberg, R.J., and Pretz, J. E. 2005, Cognition and Intelligence: Identifying the Mechanisms of the Mind, Cambridge University Press, Cambridge, UK. Stevenson, R.B., et al. 2013, ‘The evolving characteristics of environmental education research.’, in R.B. Stevenson, et al. (ed. ), International Handbook of Research on Environmental Education, Routledge, NY, USA, pp. 512-28. Tarlaci, S. 2010, ‘A Historical View of the Relation Between Quantum Mechanics and the Brain: A Neuroquantologic Perspective’, NeuroQuantology, vol. 8, no. 2, pp. 120-36. Taylor, P.J. 2015, ‘What difference does it make? An essay review of Beyond Versus: The struggle to understand the interaction of nature and nurture.’, Working Papers on Science in a Changing World, University of Massachusetts Boston, Boston, USA. UNESCO 2016, Education as a driver for Sustainable Development Goals, Plan of Action, United Nations Educational, Scientific and Cultural Organization (UNESCO), Ahmedabad, India. Van Opstal, M., Huge, J. 2013, ‘Knowledge for sustainable development: a worldviews perspective’, Environmental Development and Sustainability, vol. 15, pp. 687-709. Varki, A., Geschwind, D. H., Eichler, E. E. 2008, ‘Explaining human uniqueness: genome interactions with environment, behaviour and culture’, Nature Reviews: Genetics, vol. 9, pp. 749-63. Vroom, H.M. 2006, A Spectrum of Worldviews: An Introduction to Philosophy of Religion in a Pluralistic World., Amsterdam. Webb, T.W.W.a.G., M. S. A. 2015, ‘The attention schema theory: a mechanistic account of subjective awareness’, Frontiers in Psychology, vol. 6, no. 500, pp. 1-11. Whitehead, C. 2010, ‘Cultural Distortions of Self- and Reality-Perception’, Journal of Consciousness Studies, vol. 17, no. 7-8, pp. 1-24. Wilson, M. 2002a, ‘Six views of embodied cognition’, Psychonomic Bulletin and Review, vol. 9, no. 4, pp. 625-36. Wilson, T.D. 2002b, Strangers to Ourselves: Discovering the Adaptive Unconscious, Harvard University Press, USA. Wilson, T.D., Dunn, E. W. 2004, ‘Self-knowledge: Its Limits, Value, and Potential for Improvement’, Annual Review of Psychology, vol. 55, pp. 493-518. Wubbolding, R.E., and Brickell, J. 2009, ‘Perception: The Orphaned Component of Choice Theory’, International Journal of Reality Therapy, vol. XXVIII, no. 2, p. 50. Yip, J.A.a.C., S. 2013, ‘The Emotionally Intelligent Decision Maker: Emotion-Understanding Ability Reduces the Effect of Incidental Anxiety on Risk Taking’, Psychological Science, vol. 24, no. 1, pp. 48-55.